The English verb ‘to err’ has largely lost its positive connotations. It no longer invokes wandering, rambling, or roaming, and is now understood negatively in relation to a prescribed path or goal. To be sure, errors are acknowledged to play an important role in the pursuit of knowledge and hap-piness, but usually only to the extent that their recognition allows for their elimination, correction, and avoidance. 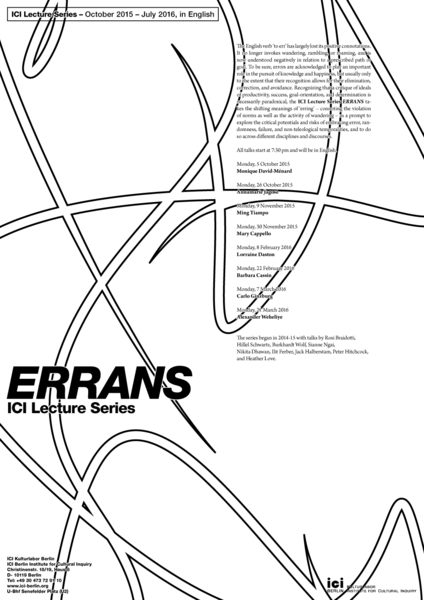 Recognizing that a critique of ideals of productivity, success, goal-orientation, and determination is necessarily paradoxical, the ICI Lecture Series ERRANS takes the shifting meanings of ‘erring’ – connoting the violation of norms as well as the activity of wandering – as a prompt to explore the critical potentials and risks of embracing error, randomness, failure, and non-teleological temporalities, and to do so across different disciplines and discourses. The lecture series is part of the ICI Focus ERRANS 2014-16.